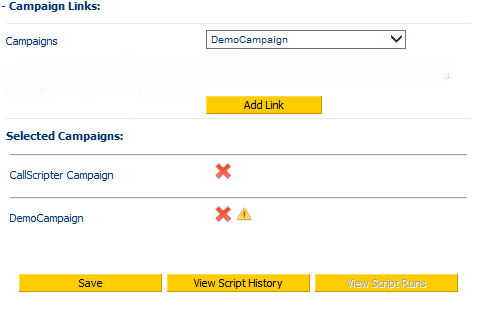 Scripts are linked to campaigns in the Script Editor module. Click on the Script Editor icon, and select Edit Scripts. Double click on the Customer name to view the script list. Single click on the script name to view the script attributes. Click on the plus sign next to the Campaign Links to view the list of available campaigns. The list of campaigns is sourced live by the system plugin (using the credentials stated in Application Settings under the ININ section to connect to the CIC server). If the dropdown box is greyed out then the credentials supplied are not sufficient to obtain this information from the CIC server. 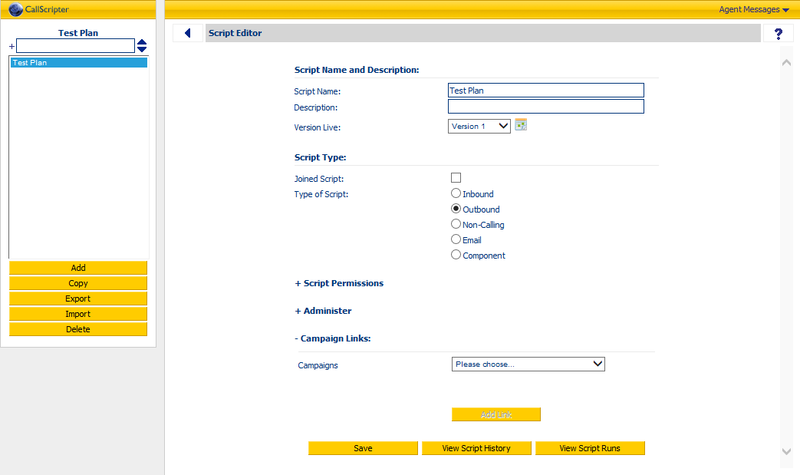 From the dropdown the user can select a campaign and click on the button. Click Save to link the script and campaign. If the selected campaign is currently assigned to a script this will be indicated with a symbol. If the user proceeds by clicking on the Save button this will remove any links to any other script. 1 : Check CallScripter server side log files for any errors with the Interactive Intelligence External Campaign Retrieval Plugin. 2: Check the right version of Icelib SDK is installed on web server - matching the product level of the CIC environment.